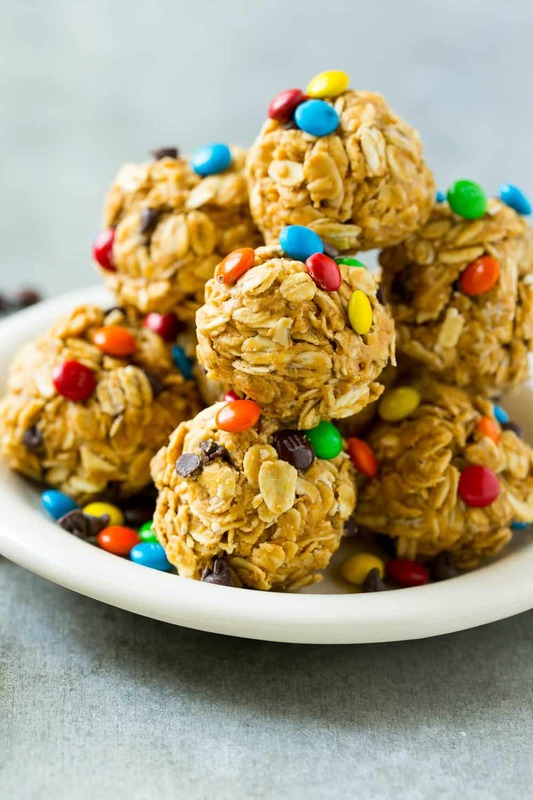 No Bake Monster Cookie Energy Bites– Easy to make energy bites that taste like a monster cookie but high in protein. They are perfect for the mornings when on the go or as a snack in between meals. What do you do when you feel like having monster cookies but you are dreading all the calories associated with munching on monster cookies? 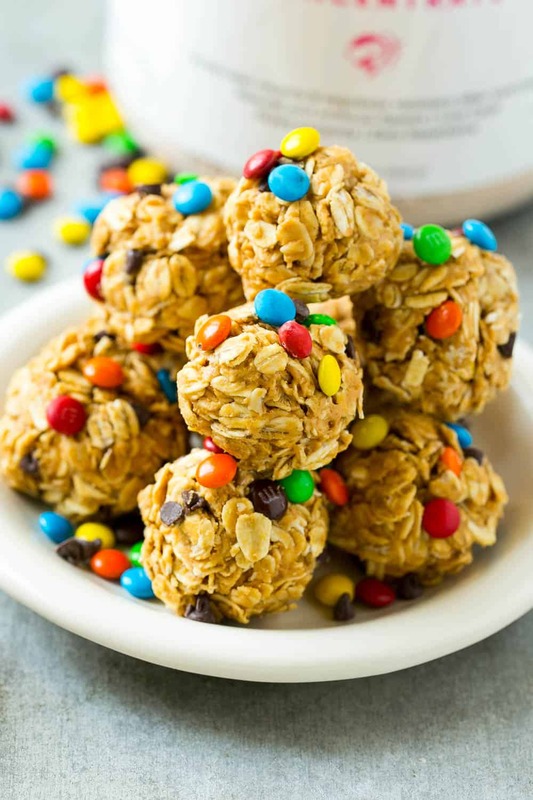 Make these No Bake Energy Bites. 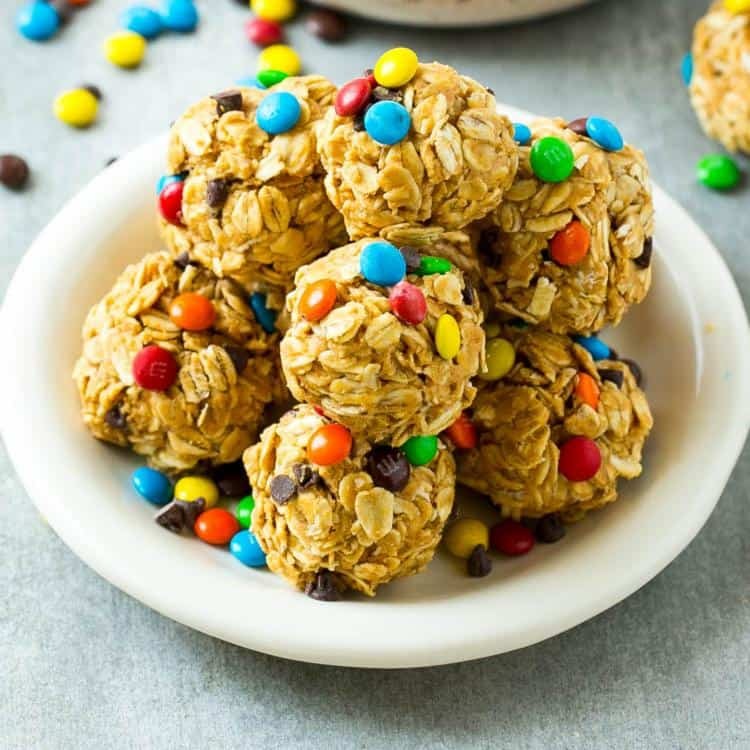 It’s your typical energy bite balls but add some tiny M&Ms to them because why not! 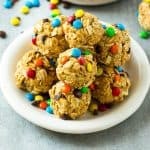 I have another recipe for energy bites that don’t have M&Ms on them! Click here to get to the recipe. 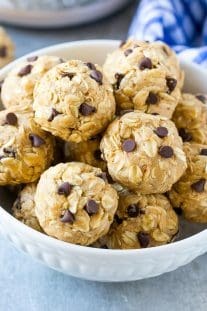 These no-bake energy bites are amazing to have as because they are also high in protein. Even the kids love them! If you prefer not to use Protein powder, you can substitute it with flax seed. 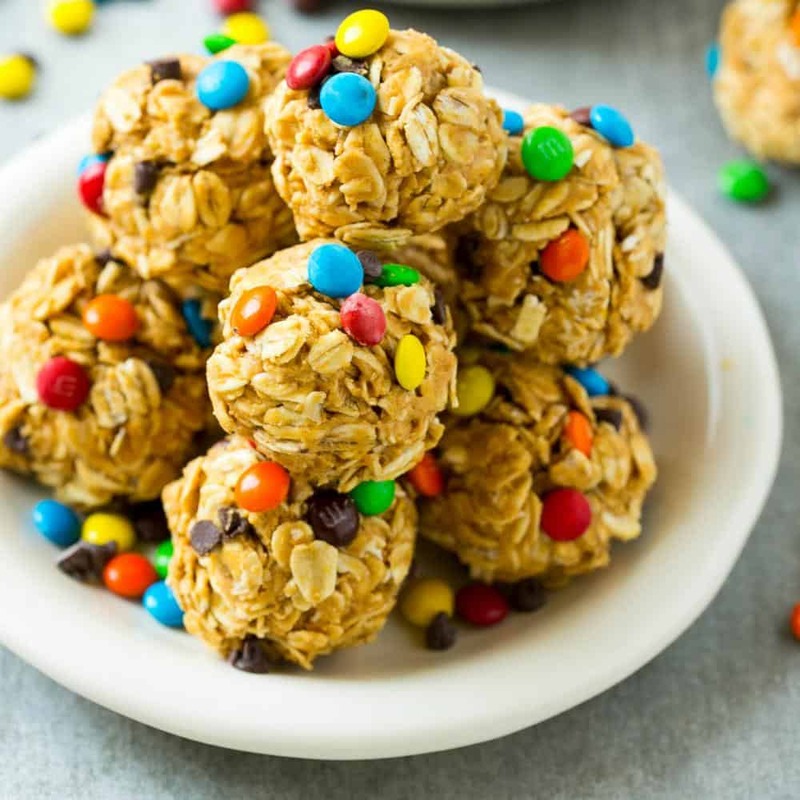 No-bake energy bites are best when stored in an airtight container in the fridge. You can leave out for a few hours if you don’t like to have them cold. But I recommend you store them in a cooler temperature. To keep them as fresh as possible, its best to store them in an airtight container in the fridge for about 1 week. Making a huge batch? You can store in the freezer for up to 3 months. When ready to eat them, just leave them overnight in the fridge or leave on your kitchen counter for a couple of hours. No bake energy bites are good for you for many reasons. They are loaded with fiber, high in protein and contains good fats. High fiber food keeps you fuller while the high protein boosts your metabolism and promotes weight loss. Healthy fats found in the peanut butter or any nut butter has been associated with lowering the risk of heart disease. Making this Monster Cookie Energy Bites? Please leave me a comment below I would love to hear your thoughts on them. If you happen to take a picture of it please let me know on Instagram so I can feature it on my stories. 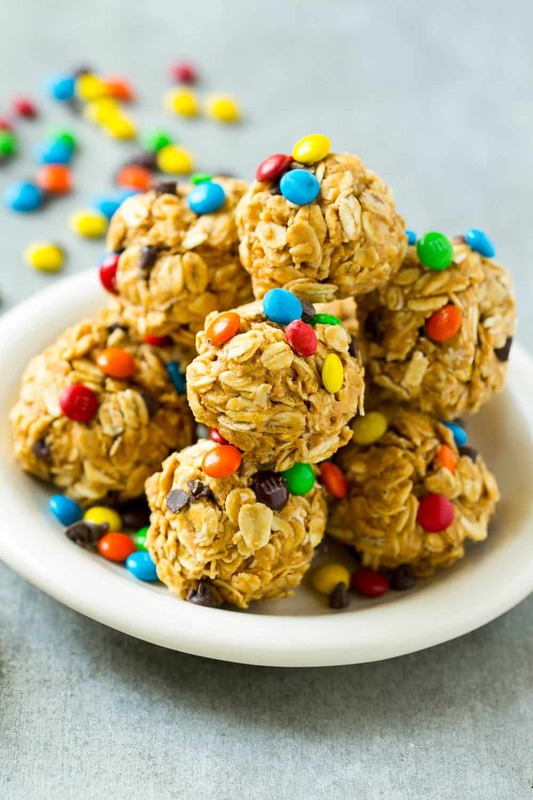 Remember to subscribe to my NEWSLETTER for free and receive all my new recipes like this No-Bake Monster Cookie Energy Bites Recipe delivered right to your inbox! If you try a recipe and you like it, please use my hashtag #healthyfitnessmeals on INSTAGRAM for a chance to be featured! FOLLOW Healthy Fitness Meals on FACEBOOK | INSTAGRAM | PINTEREST | TWITTER for all of my latest blog posts and recipes. 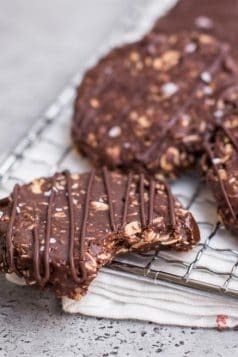 Easy energy bites that taste like a monster cookie. 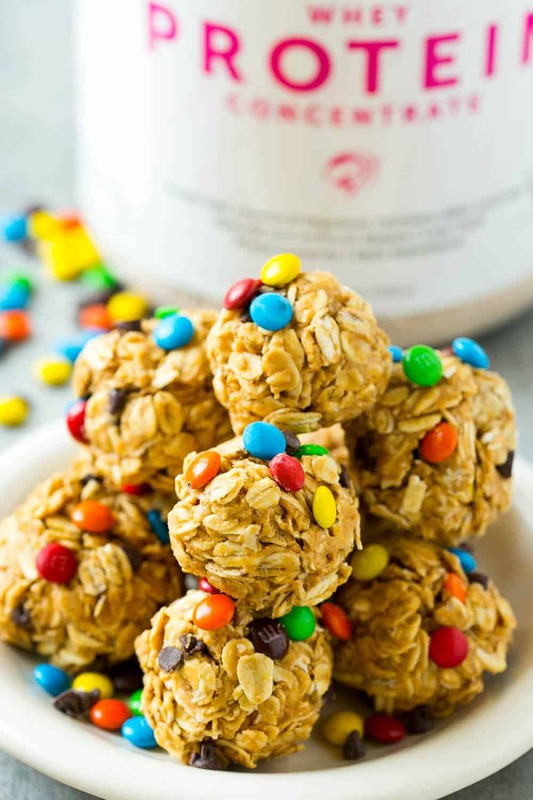 Place the protein powder, oats, peanut butter, and honey in a large bowl. Add 2 tablespoons of water and stir until a stiff dough forms. If the mixture is too dry, add the additional water, 1 teaspoon at a time, until desired consistency is reached. Stir in the chocolate chips and M&Ms. 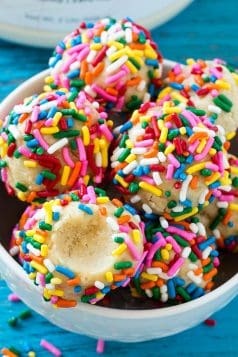 Take tablespoons sized pieces of dough and roll into balls. 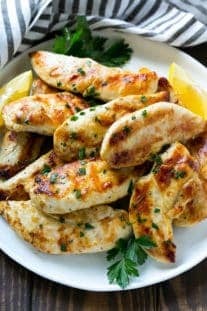 Place on a sheet pan lined with parchment. Roll the remaining dough into balls. Chill for at least 30 minutes, then serve. Store in the refrigerator. Copyright © 2019 Healthy Fitness Meals · Privacy · Terms & Conditions · Site CreditsCustomizations by Once Coupled.